When you’re a mom and a grandmother, you want to look your best. I’d always dreamed of having a nice smile and straight teeth and whiter teeth. When you’re my age, you don’t want to wait. You’re just ready to do something. You’ve postponed it, put it off maybe for financial reasons and you realize you’d better do it now or you’re not going to do it. Instead of buying a new car this year, I just put the money into myself and my smile. And it’s been less expensive, and I think there’s been an appreciation instead of depreciation. I’m surprised at how many people actually noticed and actually said something, you know, “Your teeth look great now.” They couldn’t believe how great it looked, and they were so proud of me. Exceptional dentistry has really changed my life. It changed the way I feel about my business. It gave me the confidence I needed. I wasn’t embarrassed or ashamed. 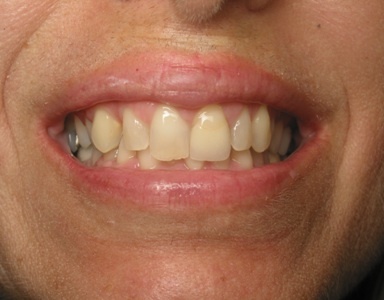 > Sandra had been a patient of ours for many years before she decided to improve her smile. She had been self-conscious about her smile all of her life and felt it was time to so something nice for herself. Sandra wanted to have a gorgeous smile that she could be proud of. We designed Sandra’s new smile using study models, digital photographs and radiographs, computer imaging, and the Golden Proportion. In one morning appointment we prepared Sandra’s teeth to receive the new porcelain and delivered transitional teeth that closely resembled what Sandra’s finished smile would look and feel like. Sandra was ecstatic with the immediate results. A few short weeks later, we bonded into place Sandra’s new teeth, custom made to Sandra’s specifications from the finest porcelain available. As you can see, Sandra’s new smile is perfect for her. Doesn’t she look gorgeous!